Consolidation Period: From February 18, 2005 to the e-Laws currency date. 1. 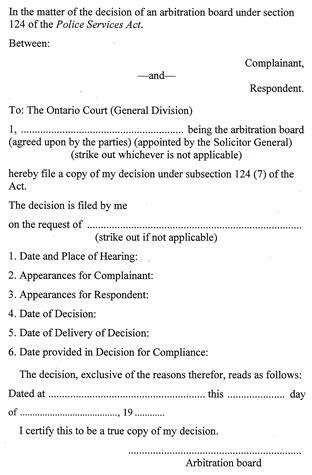 A copy of a decision of an arbitration board for filing in the Ontario Court (General Division), under subsection 124 (7) of the Act shall be in Form 1. R.R.O. 1990, Reg. 925, s. 1. R.R.O. 1990, Reg. 925, Form 1.